Welcome to Average Grades 2005! ! this software is designed for all students, from college to graduate. He will assist you in the management of your school averages. Very complete, it will provide you with statistics and summary graphs on your results. The user interface is user-friendly and easy to use. This version of the software is the result of many hours of work. Until functional version 2.95, the software was developed under Microsoft Visual Basic 6.0, so it also had a graphical interface under Windows. 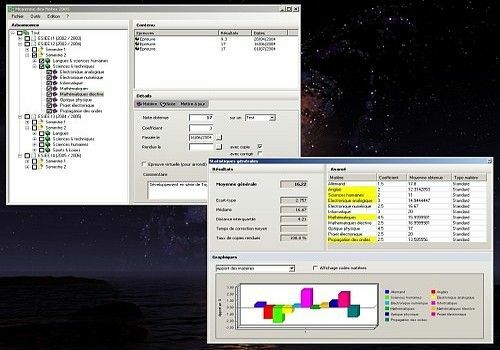 The data was stored in an Access database and controlled via the MS Jet engine and its CAD platform layer, in this version it is a complete redesign: the software is developed under .NET 2.0 with the SharpDevelop Beta 2 environment. The data is managed by ADO.NET. When starting the software, you can create a new note database from the "File", "Database" and "New" menus, save the file in the directory of your choice and validate. The root of the "All" tree then appears. You can now add new items, either by right-clicking or via the "Edit" menu.